Members of the Convention Army——British and Hessian troops surrendered by General John Burgoyne after the battle of Saratoga in 1777——became prisoners of war after Britain and the Continental Congress failed to reach an agreement which would have allowed the troops to return to England. (See previous post.) According to the prevailing conventions of warfare, prisoners of war were supposed to be provisioned by their own country, but this rule was often ignored or impracticable. There were three ways for prisoners to gain some or all of their freedom: exchange, parole, and desertion. Only high ranking officers were candidates for exchange and this was negotiated by the Continental Congress. States and local governments could grant parole on an individual basis; parole allowed soldiers limited freedom contingent on their promise not to engage in fighting. Because it was hard to provide for POWs, they were often paroled to farmers to help till the soil and also to provide their own food. Some prisoners with their own funds or money sent by relatives could purchase extra food and other supplies. Quite a few prisoners would desert. With the British failing to send supplies for the prisoners, it fell to the states and local communities to provide them with food and shelter (even in some private homes), and to local militias to guard them. When a state reached the limit of its ability to care for prisoners the Continental Congress ordered them moved to another state. 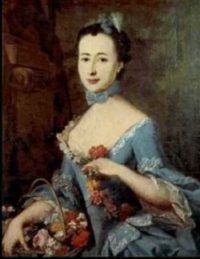 One of the most interesting diaries of the Revolutionary War era is that of BARONESS FREDERIKA VON RIEDESEL. 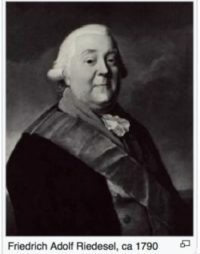 Her husband, Major General Friedrich von Riedesel, was an officer in charge of a contingent of Brunswickers recruited by the English to fight in America. He became the commander of all the Hessians (and Indians) in the Saratoga campaign. Seventy-seven wives had accompanied the Brunswicker soldiers including some wives of officers. Among them was Frederika who traveled from the Continent with three children, the youngest of whom was still a babe in arms, to join her husband in Canada. After the defeat at Saratoga she accompanied the Convention Army to Boston. She describes her arrival there. We finally reached Boston, and our troops were quartered in barracks not far away, on Winter Hill. We were put up at a farmer’s house, where we were given only one room in the attic. My maids slept on the floor, and the men in the hall. Some straw on which I had spread our bedding was all we had for a long while on which to sleep . . . .
We stayed in this place three weeks before we were then taken to Cambridge, where we were put up in one of the most beautiful houses, previously the property of royalists [loyalists]. [On Brattle Street which was called “Tory Row” because of the number of loyalists who resided there.] . . . .
We lived in Cambridge quite happily and would have liked to stay there as long as our troops were held prisoners, but as the winter drew near, we got orders to go to Virginia. In January and February of 1779, during a hard winter, the troops and their followers, on low rations, were marched to Charlottesville, Virginia. Baron von Riedesel secured a carriage for his family but made the trip with his troops. The Baroness recounted experiences on the journey and upon her family’s arrival in Virginia. Our destination was called Colle, in Virginia, where my husband had gone on ahead with the troops and now awaited us with impatience and longing. We arrived there in the middle of February 1779, having gone from Boston through the provinces of Connecticut, New York, New Jersey, Pennsylvania, and Maryland, traveling 678 English miles, in about twelve weeks. . . . The troops were in Charlottesville, two hours away. One had to go through a beautiful forest to get to them. At first they were very uncomfortable there. They had log cabins, but these were not plastered, and they lacked doors and windows so they suffered terribly from the cold. They worked very hard to build better houses . . . and in a short time the place became a pretty town. Each of the barracks had a garden in the back and a nice little fenced in yard for poultry . . . . We had a large house built with a big room in the center and two smaller rooms on each side, which cost my husband a hundred guineas. . . . A number of Negroes brought us everything they had in the way of poultry and vegetables . . . . In the summer we suffered terribly from the heat and lived in constant fear of rattlesnakes, and the fruit was completely ruined by three sorts of insects. We had heavy thunderstorms, sometime five or six a day, and the wind was so terrific that a hundred trees or more were uprooted. . . . We had no chairs at all, only treestumps on which to sit, and these were also used for tables by laying boards across them. . . . My husband was always sad, and, what was more, he could not stand the heat at all, which went as high as 103 degrees and was most oppressive. More about the von Riedesels and the Convention Army in the next post. Marvin L. Brown, Jr. A Revised Translation and Introduction and Notes, Baroness von Riedesel and the American Revolution: Journal and Correspondence of a Tour of Duty 1776-1783 (Chapel Hill, NC: University of NC Press, 1965), pp. 68, 69, 72, 79, 80, 82-83. The portrait of the Baroness is by Johann Heinrich Wilhelm Tischbein in 1829. The illustration is a framed 1789 engraving, “Encampment of the Convention Army at Charlottesville, ACHS 1848, Special Collections, University of Virginia Library, Charlottesville, Va. Other posts on Baroness von Riedesel can be found HERE, HERE, HERE, and HERE.